Located in a quiet, no-fly zone, Hilton Chicago O'Hare Airport is ideal for savvy travelers. Guests an enjoy the indoor swimming pool and dine on delicious steaks, seafood and more. 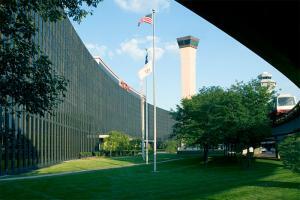 Hilton Chicago O'Hare is the only hotel located directly inside O'Hare International Airport. The hotel is just a short ride from the shops, restaurants, and bars of downtown Chicago. Within walking distance to all domestic terminals via underground walkways and the Blue-line train to downtown Chicago.